It has often been said that it takes a special type of individual to serve in the military. Actually, if you think about it being in the military and being a cannabis activist aren’t that far apart if you remove the part where the bullets are flying. We work long hours in extreme hot and cold temperatures, we sit in the wind and the rain while performing our tasks, and at the end of the day, we ultimately want to help those too tired, weak or scared to help themselves. 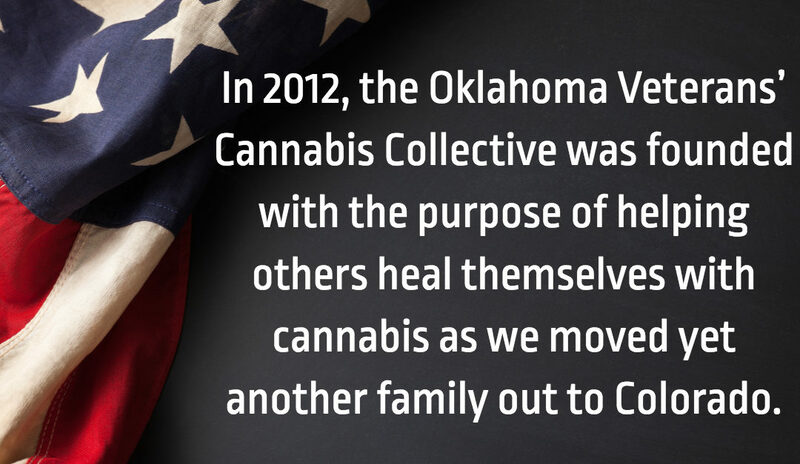 In 2012, the Oklahoma Veterans’ Cannabis Collective was founded with the purpose of helping others heal themselves with cannabis as we moved yet another family out to Colorado. The founders wanted to do something to make a difference and help those unable to help themselves so we began educating those willing to learn. While the collective began to come together, members spread out across Oklahoma helping carry the first of the petitions starting with the decriminalization petition. At first, our goal was to assist with cannabis education and get as many voters registered as the petitions kept coming, all while fighting to change things so the exodus of families leaving to legal states would hopefully end. Now with the passage of SQ 788, our mission focus has started to evolve. Moving forward the primary mission of the Veteran’s Cannabis Collective will be to provide low-cost affordable cannabis to Veterans and their dependents while also cultivating a variety of produce and other crops. Besides cultivating medical cannabis the collective will also be retraining Veterans through internships. These internships will allow Veterans to develop the skills necessary to obtain employment in the cannabis and hemp industry or simply give them the tools to take care of their personal garden. The collective is structured as a Not-for-profit corporation. This serves a dual purpose by allowing a safe place for Veterans to come together and work to better themselves and the community. We are focused on fighting the stigma that cannabis currently holds and make our neighborhoods a safer place. In 2019 the Veterans’ Cannabis Collective will continue the legislative discussions started in 2018 with lawmakers to ensure certain protections for veterans and patient collectives across the state. For Oklahoma, education means just as much as safe access, and for that reason alone we will continue to stand on those front lines fighting for patients everywhere. have you looked in to Tribal Veterans in Oklahoma ? iam a veteran and live in Tonkawa,oklahoma member of the Tonkawa Tribe of Oklahoma. Kris, I deeply appreciate your efforts to foster sensible change, showcase the will of “the people” and to help veterans improve the quality of their lives. I want to see OBN’s campaigning against cannabis stopped in its tracks. Their representatives continue to lie to the public – at taxpayer expense – about cannabis. They continue to tell our school children things like ” if you take CBD you will fail a drug test”. Let’s make stopping such nonsense a priority in 2019. Thank you for what you are doing! I’d love to get involved with your program to help if I can. We need to end the 22 a day and this is just one way it can help.